For those who want to shine in Freestyle on skis and snowboard, can polish up their skills in our Snowparks, Funslopes and Funcross routes. Pipes, rails, boxes and kickers are perfectly prepared for all jumps and slides. Then it is no wonder that the stars on the scene meet up here throughout the whole season and not just for the international Freestyle competitions, so you can learn some spectacular tricks of them throughout the whole season. The greatest fun is guaranteed here on skis or a snowboard. For all those who prefer to take things a little bit easier, then the Funslopes and Funcross routes in ski amadé are perfect. The hybrid between slope, Snowpark and Ski Cross with small jumps, waves, bridges, tunnels and tight turns make every skiing day more fun. Where do you look for skiing fun? Twice a month, at the Cash 4 Tricks Tour, you can turn tricks into hard cash. Alternating between the Snowparks in Ski amadé, the judges assess the skills of the participants and reward the best or craziest tricks. Amazing! 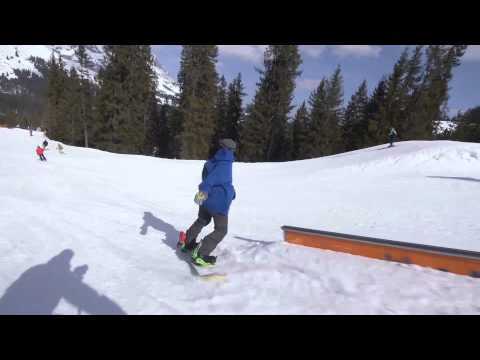 At only 14 years of age, Matej has done his first triple in the snowparks of Ski amadé. Respect! Kickers, powder, fun slopes - with RIDE Ski amadé everything revolves around the favourite themes of boarder and freestylers..
Who run the world - GIRLS! Hier steht alles genau unter diesem Motto! Das Motto der Girls Shred Sessions am Blue Tomato Girls Day im Superpark Planai! Ob Profi oder Anfänger - falls du deine Skills noch erweitern willst, bist du in der Absolut School mehr als nur richtig! Slope Maps, smart routing, all information regarding ski huts, lifts, highlights and more. Like, share, post your favourite content directly from the ski slopes. The ultimate skiing day awaits you – experience memorable holiday moments. Available for free on iTunes and Google Play worldwide! So, are you in the mood for a ski or snowboarding holiday? Look now for suitable accommodation and book!